Online audio for this show was underwritten by ShowCase Realty. Iran has been in the headlines continually. So it is timely for our rotating series about the ethnic heritage of Indiana - which has explored a vast range from German, Irish and Scottish to Cuban, Colombian/Venezuelan and Russian immigration - to look at the Persian and Iranian heritage in the Hoosier state. Nelson's studio guests will include Cyrus Jafari, a Realtor and entrepreneur in Indianapolis who grew up in Iran and immigrated at age 24 in 2001. 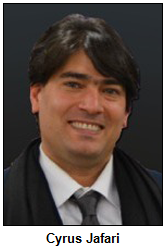 Cyrus, past president of the Society for the Preservation of Persian Culture, is the owner of Showcase Realty. He also owns the former Earth House (a historic structure that once housed the Lockerbie United Methodist Church) and eventually hopes to open a Persian coffeehouse there. 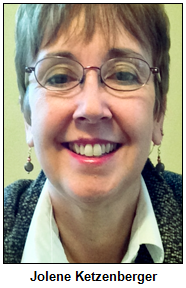 Nelson and Cyrus will be joined by Shayda Bradley, the executive director of design and construction for IU Health. A native of Iran, she left the country at age 18 in 1978 following the overthrow of the shah. The assets of her family, which she described as "educated and middle class," were frozen. 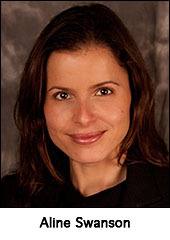 Like Cyrus, Shayda is a past president of the Society for the Preservation of Persian Culture. "Basically, people who have come from Iran are in one of two groups," Cyrus says. "The first group came before the revolution in 1977 and often were supporters of the shah. The newer group, people like me, grew up in Iran after that and never experienced what the country was like in the past." According to Peopling Indiana: The Ethnic Experience (Indiana Historical Society Press, 1996), few Iranians came to Indiana - or even to the United States - before 1900. During the last 50 years, though, many have come to study medicine, engineering and other fields at universities. Although our guest Cyrus Jafari grew up in Iran, he was born in the United States because his father came to study electrical engineering. During his youth in the historic Iranian city of Isfahan, Cyrus met his wife, Nasim. She immigrated several years after Cyrus and is a chef at the Eagle's Nest restaurant in downtown Indy. After leaving Iran, our guest Shayda Bradley eventually made her way to Purdue University. She earned degrees in engineering and construction technology and has lived in Indianapolis for more than 30 years. Before her current executive position with IU Health, Shayda and one of her sisters ran a boutique. Then they designed and marketed upscale, fashionable clothes for women. Because of the volatile relationship between Iran and the United States, Cyrus reports that some immigrants are reluctant to identify their heritage. "If you are ashamed to be Iranian, you tend to call yourself Persian," he says. Cyrus, who has dual citizenship, has been able to travel freely in and out of his homeland; he visited Iran last year. Columbia University, Center for Iranian Studies. 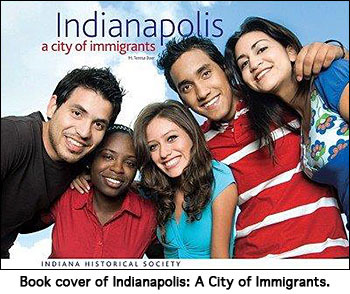 Indianapolis, A City of Immigrants - by M. Teresa Baer, page 39, Indiana Historical Society. Statistics about Immigrants from Indianapolis - Immigrant Welcome Center. The Iranian Americans - PBS documentary. Our Guest Roadtripper and public historian Glory-June Greiff tells us: "Valparaiso is an interesting city on the historic Lincoln Highway - both routes - in northern Indiana. That is, it's on the original 1913 route that ran through Goshen, Elkhart, South Bend and LaPorte, and also the straighter version rerouted in the 1920s that became (mostly) part of the original U.S. 30. Tracking the above-ground archaeology remaining of this road is always a good excuse to head up that way!" Valparaiso, which had become a bit sleepy, has really awakened in recent years. Its downtown, listed in the National Register of Historic Places, is buzzing with restaurants, coffee shops, art galleries and boutiques, many housed in cool historic buildings. I can recommend Bon Femme Cafe right on Lincolnway, which offers tasty food and an interesting atmosphere. Is your sweet tooth aching? The many cupcakes at Designer Desserts may soothe it! There are any number of other shops to explore as well." 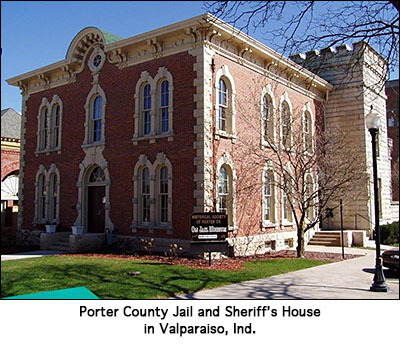 Valparaiso is the seat of Porter County and boasts a historic courthouse with a checkered history. Built in 1885 (replacing an earlier brick structure on the same site), the current building suffered a severe fire in the 1930s that destroyed its tower. The courthouse was partly restored, forgoing its tower, so it remains a bit of an architectural oddity. Immediately southeast of the courthouse is the Porter County Jail and Sheriff's House, built in 1860-1871, that today houses a museum and the Historical Society of Porter County, definitely worth checking out. And the town is home to Valparaiso University, which boasts a wonderful collection of outdoor public sculpture on its campus. A founding member of the International Center of Indianapolis is a well-known artist who was born in India. He was trained as an architect and came to the Hoosier capital during the 1960s to be a city planner for then-Mayor Richard Lugar. Eventually, he became a full-time artist who has won acclaim for his pen-and-ink drawings of landmarks including churches, monuments and memorials in Indiana, his homeland of India and elsewhere around the world. Although he was one of the first members of the Sikh faith (the world’s fifth largest religion) to settle in Indianapolis, the metro area now has several Sikh temples. The artist helped start the International Center in the early 1970s. 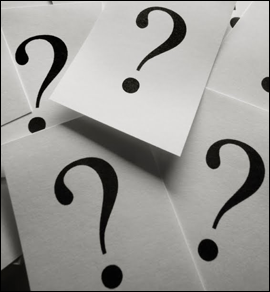 Question: Who is the well-known artist? Hint: He has been a Hoosier History Live guest when we have explored the Sikh heritage in Indiana. Please do not call into the show until Nelson has posed the question on the air, and please do not call in if you have won any prize on WICR during the last two months. The prize pack includes a gift certificate to the Tin Roof in downtown Indy and two admissions to the Indianapolis Children's Museum, all courtesy of Visit Indy, and two passes to Glo Golf in the Circle Centre Mall in downtown Indianapolis, courtesy of Glo Golf. Pork tenderloins and persimmon pudding are on the menu for this show. So are sugar cream pie, beef Manhattan sandwiches, fried biscuits, apple butter and Van Camp's pork and beans. Also on the menu: the heritage of canning. It is intertwined with our Hoosier food history, thanks in no small part to the enterprising Ball brothers who came to Muncie in the 1880s. In this encore broadcast of one of the most popular shows in our Hoosier History Live archives (its original air date was Aug. 30, 2014), Nelson explores classic Hoosier foods - and topics related to the state’s traditional cuisine - with one of the state's best-known food journalists. Jolene Ketzenberger, the Indianapolis-based founder and editor of the local food website EatDrinkIndy, has covered the Hoosier culinary scene for more than 20 years. "I think it's clearly a cousin to the schnitzel, which seems reasonable, considering the German heritage of many Hoosiers." During the show, Jolene and Nelson discuss Nick's Kitchen in Huntington, which claims to have invented the pork tenderloin sandwich. The restaurant's beginnings date to 1904, when founder Nick Frienstein began selling his wares from a street cart. A few years later, Nick's brother started frying - and breading - pork cutlets to sell as sandwiches. Some sandwiches served elsewhere have much more limited appeal, including one that Jolene calls a "southern Indiana classic": the brain sandwich. Jolene, who enjoys shopping in farmers markets and trying new recipes, reports she felt compelled to make a brain sandwich so she could include it in her Cafe Indiana Cookbook (2010), which she co-authored with Joanne Raetz Stuttgen.Tune in to the show to savor the details about the brain sandwich. During the show, Jolene also shares her research that indicates the Beef Manhattan sandwich may have originated in Indy. Topics also include the national impact of Ball Corp.; its factory in Muncie was opened in 1888 by five Ball brothers, who achieved tremendous success, particularly with their famous Mason jars. 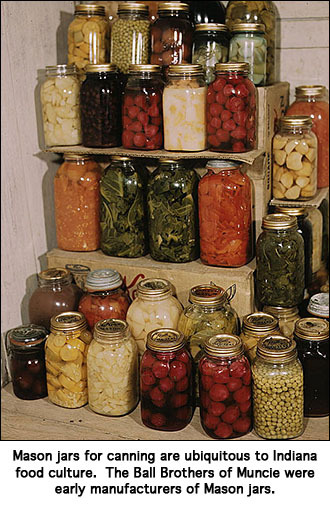 The glass jars were used across the country for canning many homegrown products, including some, like tomatoes, that also have a long association with Indiana. The Tenderloin Connoisseur - Rick Garrett's blog, which is devoted to the search for the perfect tenderloin sandwich. Hilltop Inn in Evansville - Home of the fried-brain sandwich. Beef Manhattan - A Hoosier original. Eat Drink Indy - Jolene's website covers the Indy food scene.